Cities as an Eco System? A comment and question after the talk in Liverpool led to an interesting pre-dinner networking discussion. Are cities an ecosystem? For a short response the answer is yes, but, as in all eco systems, its complex, but makes for a great theme for future Specifi talks! The question was prompted by my showing of the Wolves in Yellowstone video and mention of Barry Commoners four laws of ecology. Law 1 Everything is connected – the space between buildings, our pollinator pathways, our water systems, our green infrastructure all have a profound bearing on our health, wellbeing and mental state. Law 2 There is no waste in nature – something we are starting to embrace, as we develop circular economies and strategies for the built environment, and cities design on circular economy principles. Eco systems, and as cities should be, are regenerative, providing co-benefits beyond our designs, city planning and city management. Such co-benefits we are now recognising as the health co-benefits of green infrastructure within cities. 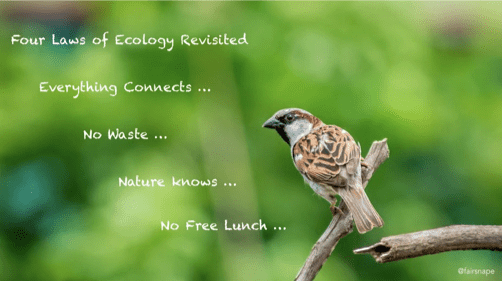 Law 4 There is no such thing as a free lunch – any intervention with nature needs to be repaid. The longer we delay repayment the more separation and damage we cause. To design and operate cities as an ecosystem, having a new level of consciousness in our relationship with nature is key. Over the centuries we have tried hard to prevent cities and towns acting as a eco system, designing and constructing objects (buildings) with little thought to the spaces between buildings. Following the Liverpool event, I flew out to Portland for the Living Futures Conference, where a ‘15 minutes of excellence’ keynote described how the city of Portland had imposed its rectangular East – West, North -South, grid of streets over a natural river and water course that severed relationship with natural place and land. A good place to start, in thinking of buildings and cities as eco systems, is in the adoption of ecological and biophilic design, as we (Elizabeth Calabrese and myself) explored and led a Living Futures workshop – creating facilities and spaces that foster hopefulness, rather than hopelessness, social collaboration not isolation. This entry was posted in comment on June 4, 2018 by martin brown. If cities were built as eco-systems, then we should expect that they become self-sufficient (hence not impacting the “outside” of the city), like a self-sustaining ecosphere. So yes, in that case this an interesting idea as it would mean cities would be truly “neutral”.